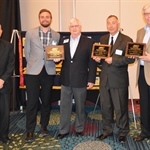 The airport's Runway Improvements Project received the Transportation Project of the Year award from the KC Metro Chapter of the APWA. Improvements included an extension of the north/south runway 18-36 to 5,501 feet x 100 feet. Staffed seven days a week from 6 a.m. - 7 p.m. After-hours service available upon request. 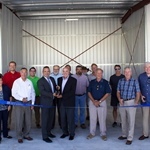 Lee’s Summit City leaders and over 80 guests celebrated the completion of Lee’s Summit Municipal Airport’s new t-hangars with a ribbon cutting ceremony held Friday, August 10. Hours of Operation: Mon - Sun 6 a.m. - 7 p.m.
*This number is answered by Customer Service Staff from 8 a.m. - 5 p.m. Monday through Friday. Outside of those hours, the message will prompt you to "press 2" to reach the Airport.